Dry tropical forests are located near the equator where the temperature stays above freezing all year. They do not receive much rain during the dry season and may receive high rainfall in the wet season. If more rainfall occurred during the dry season, these areas would be tropical rain forests. Plants have adapted to these dry periods by dropping their leaves to conserve water. Hawaiian reynoldsia (scientific name Reynoldsia sandwicensis) is native to the dry tropical forests of Hawaii. It grows on the large islands from Niihau east, except for Kauai, in niche habitats from 100 to 2,600 feet in altitude. These dry tropical forests receive very little rainfall in the summer due to micro-climates created by the mountains. It is not uncommon for the Hawaiian reynoldsia to lose its leaves during the summer to conserve water. Hawaiian reynoldsia is considered a deciduous tree that grows to a height of 50 feet with a 60-foot spread. It has light green heart-shaped leaves that are 2 to 4 inches in length. It has small non-impressive clusters of flowers in fall that range in color from green and yellow to orange and purple. It is best grown as a specimen tree in full sun and well-draining soils that are allowed to dry out. The kapok tree (scientific name Ceiba pentandra) is thought to be native to tropical South America but has been planted widely around the tropical world. It thrives in dry forest areas where there is a wet and a dry season. These trees grow very large, up to 150 feet tall with a trunk diameter of 9 feet. The trunk is covered with small thorns and buttressed at the base. The compound leaves have five to nine leaflets that are 3 to 6 inches long. 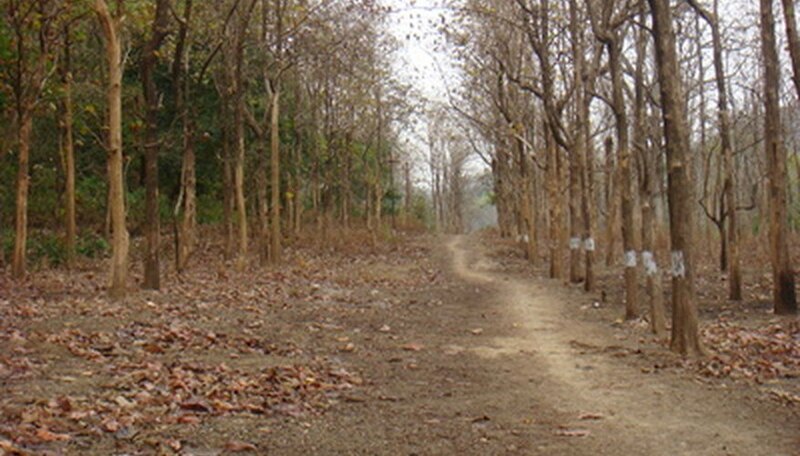 The leaves drop in the warm dry temperatures that are characteristic of dry tropical forest summers. The fruit is small and oval-shaped about 3 to 6 inches long. The fruit is filled with small round brown seeds and fibers similar to cotton. Kapok trees are rarely grown in cultivation but were once grown commercially for their silky cottonlike fibers that were used as insulation and for stuffing. Now synthetics are used instead. Teak trees (scientific name Tectona grandis) are native to the seasonal dry tropical forests of India, Myanmar and Thailand. They are tall deciduous trees growing to 115 feet high in wetter areas but smaller in the drier parts of their range. Teak is extensively farmed in tropical and subtropical areas around the world for its valuable wood. The leaves are oval-shaped and green. It produces numerous clusters of small white flowers that later develop into hard-shelled fruits. Teak will grow in just about any soil conditions as long as it drains well. It does best in full sun but can tolerate partial shade. it is a very drought-resistant tree but will perform better with regular water. The trees will be damaged in a freeze but have been known to withstand brief frosts.